Great Northern 279A, Interbay Yard, Seattle, December 27, 1964. 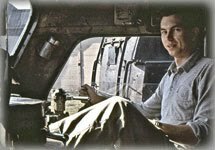 Home on leave from my first year in the US Air Force! And my buddy Elwin Purington, hitting the usual hot spots – Great Northern Interbay, Northern Pacific Stacey, Union Pacific Argo, Milwaukee Van Asselt, and Northern Pacific Auburn. Railroading in Seattle in those days was a cornucopia of sights, sounds, and equipment! These two units were originally built as ALCo/GE demonstrator’s 1602A (model DL-212) and 1602B (model DL-213) and sold to the Great Northern. These units are sporting the so-called “simplified” Empire Builder paint scheme. At least a day or two was shaved off the down time for each unit by dropping some detail. Compare to GN 279A, wearing the full-blown Empire Builder paint scheme, used on the varnish – in this case, the “International” service running between Seattle and Vancouver (BC). Fortunately, she and her sister were both spared the indignity of the “Big Sky Blue” paint job. This freighter is now completing the final leg down the magnificent Puget Sound, entering Interbay yard. As these tired units and crew pass me, I tolerate the discordant firing order of the 4-cycle V-12 motors, giving them credit for completing their assignment westbound over the Cascades, finally reaching tidewater at Everett Washington. A pair of EMD’s is trailing, patiently calling out their orderly 2-cycle chant. Soon they will be in the hands of the fastidious hostlers who will administer some tender loving care, and tie them up for the evening. You know what? 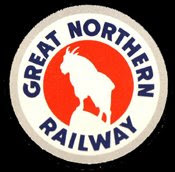 I really really miss the Great Northern, and am truly blessed to have been able to see and hear these units at work. As I’ve mentioned before, GN dispatch had no problemento in mixing and matching models from different manufacturers to create power packs! 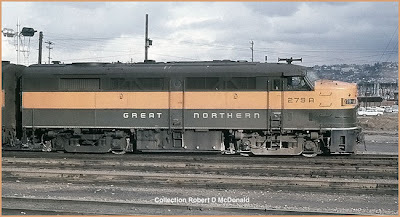 Railroad Stuff: Great Northern 279A, 4-cycle V-12 Model 244 motor, 1, 600hp class FA2, originally built as ALCo/GE demonstrator 1602A, model number DL-212, November 1950, serial number 78271. Traded to General Electric for a U33C in March 1968. 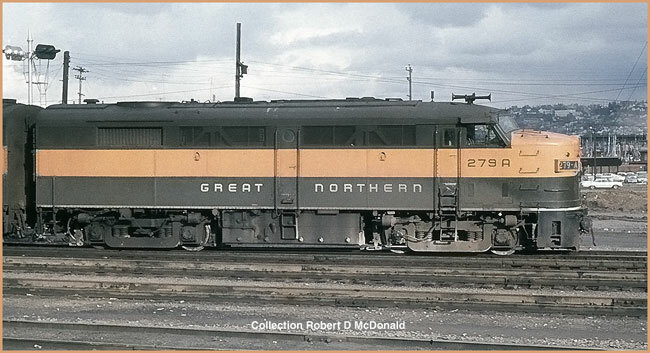 Great Northern 279B, 1,600 originally built as ALCo/GE demonstrator 1602B, model number DL-213, November 1950. I seem to be the only person that likes Big Sky Blue. Drill Baby Drill: We're Baaack! FT 103 "The Diesel That Did It!" High Speed Rail Moves Forward!